Friends or Foes? A Game of Shifting Dangers! The Shadow Fey are here, and they’ve turned the city upside down. Now their ambassador demands that the player characters explain themselves, for interfering in a perfectly legitimate assassination! 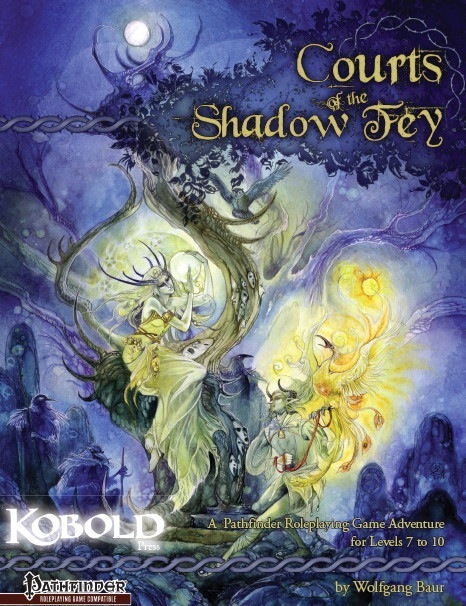 So begins this fan-favorite adventure from award-winning designers Wolfgang Baur and Ben McFarland that takes adventurers from Midgard’s Free City of Zobeck to the Plane of Shadows. There they will face the Queen of Night and Magic herself in an inventive take on courtly combat and sandbox roleplaying. Enter the world of shadows to play the Pathfinder RPG on a whole new level! Note: The Print/PDF bundle includes the Courts of the Shadow Fey Poster Maps PDF and the Bonus Handout PDF; purchasers of the print-only or PDF-only editions may download the Courts of the Shadow Fey Poster Maps and Bonus Handouts separately. Ships from our warehouse in 3 to 15 business days. All time great adventure in need of a nice update! Let's get this straight, this is easily a five star adventure that everyone should play at some point in their gaming career. This adventure was originally written for 4th edition and then ported over to Pathfinder, creating a few problems. The organization is a bit sloppy throughout and information is scattered throughout the book. That said, it is worth the effort to run, as it is just that darn fun. My advice on running this is to dive head first into all things Midgard. In order of importance, a GM should have access to the Midgard Campaign Setting, Zobeck Gazetteer, Dark Fey, Midgard Bestiary and Midgard Legends - at a minimum. The world of Midgard is so deep and rich that it begs to be explored. When I ran this, I ran it for a group of mythic characters, so I had to do an extra level of conversion to make it work. My simple solution was to give all of the shadow fey the advanced, mythic agile and unseelie (Advanced Bestiary) templates. This was a simple solution that worked to increase the power levels to mythic and managed to give the shadow fey a certain "feel" as the mythic agile template made them quite annoying. This is not a typical adventure. There are a few fights to the death early on, but once the PCs make it to the courts proper, they are bound by the rules and laws in place therein. Fights are replaced by duels and diplomacy is helped by rise in status. There are elements of the plot that are a bit confusing and not at all spelled out in an obvious fashion, but if one reads the reviews here, you can figure out what to do or what to avoid. I really would love to see another Pathfinder edition of this adventure, but with the shift to second edition coming soon, this version of the adventure is all we're going to get. There’s a nice mix of encounters, environments and scenarios throughout this adventure that provide excellent encounters for your party. The adventure itself is broken into three parts. The first involves the PCs becoming aware of the problem with the shadow fey and traveling to the courts. The second part involves the PCs building their status within the courts, so they may speak to the queen and petition her to release the claim on Zobeck. The final section is where the heroes set out to find the Moonlit King and get his word to relinquish the claim. It sounds simple, but this is such a rich sandbox full of intrigue, political maneuvering and various trials that can stretch this adventure out to make it twice as long as a normal adventure. When I ran this, I converted it to Golarion by replacing all of the early Zobeck scenes with Sevenarches. In order to do this, one needs access to Pathfinder Chronicles: Guide to the River Kingdoms and First World: Realm of the Fey in order to tie into the fey lore between the worlds. This wound up making the adventure a fascinating excursion to Midgard and the Shadow Plane. I further supplemented this adventure with scenarios from Tales of the Old Margreve and Midgard Tales, respectively. There are status modifiers in Midgard Tales, so when the players heard tell of the Lost Library of Stross in “Between the Stacks”, they decided to pursue it to help improve their status. As I said earlier, Midgard is a very rich universe, so we took every chance we could to explore every nook and cranny before the players completed the adventure and returned to Golarion. I give this adventure my highest recommendation with the caveats mentioned above. The work you put into it will be richly rewarded. Run this today, if you want a planar adventure that will give you and your players great gaming memories for years to come. I just finished running this adventure for a party, and while it has several interesting elements and some nice presentation, it is also deeply, deeply flawed. I haven't written many reviews, so I'll simply use dot points. -This module was ported from 4e, and it SHOWS. Skill challenges, rituals and general skill checks have been ported with little concern for the skill bonuses your average Pathfinder character can reach. Several skills have also been sloppily converted, poorly equating 4e and Pathfinder skills in several areas. Sections are also not designed for a Pathfinder PC's bag of tricks, near-constant flight for example, even at the end of the adventure. Other 4e-isms remain. A few sections refer to 'daily powers' and other such 4e concepts directly. A large final section of the game goes to a great deal of effort to prevent 'rest' and incurs hitpoint costs for certain options; clearly sloppy conversion, given the proliferation of wands of CLW. -The only maps I could find for this adventure were covered with 'PCs start here' and 'place monster here' tokens. Since these maps also include 'traps here' indicators, you can easily see why this is bothersome and a bit lazy. -Some of the monster math can be dodgy. Improperly calculated hitpoints are fairly common. -The beginning of this adventure is subtly flawed in that it was clearly designed for a very specific type of party- namely, a murderhobo party. I'd say about 25 to 35% of the content in the first chapter deals with situations where the party insistently ignores or refuses to progress within the adventure, without any particular reason. While you could call this important for helping the GM if problems come up, sometimes the degree to which the adventure anticipates the PCs will simply ignore the adventure borders on nonsensical, and provides less material for other parties who begin with a degree of investment in the adventure. -Monster design is frequently not amazing. While it's appreciated that it offers combinations for multiple CRs for each encounter, there's a strong tendency to design monsters to have high to-hit bonuses, but very low damage bonuses, and for them to lack alternate movement modes and ranged options. Some 4e-centric design also shows in some of the encounters. A battle against some giants very clearly attempts to emulate the 4e version of the fight, where I assume 'push' maneuvers are a lot easier and more dangerous. be swarmed and overrun by ___. Any non-good PC “killed” by ___ is transformed into an NPC in his service. Unaligned PCs become evil, and evil PCs become chaotic evil" under 'development'. This strongly suggests that the fight is meant to be unwinnable, despite the fight not otherwise being described that way, and it later describes treasure discover-able within the encounter chamber. A decent few encounters, particularly social ones, have similar ambiguities, and require details to be pulled from very different sections to generate a picture of what should happen. -A more basic error is the proliferation of spelling errors. In several sections, including on maps and handouts, formatting errors and repeated words can easily be found. "City of City of Corremel" for example. There are also a few clear errors in the book; lines and markers that were put in as part of drafting but weren't caught by editors. -My final and largest complaint deals with the ending to the adventure. To my mind, confusion in outlining the plot and outcomes, in describing the scene and characters involved, becomes so challenging as to render the final section unplayable as written without significant work by the GM. In spoilers below, I will get into specifics. For this point, suffice it to say that in this section, it is incredibly difficult to determine if certain key plot revelations are true or false. Some sections suggest they are true, others false. Also, some exceptionally basic information is contradictory, or missing entirely. The final section of the adventure concerns encountering the Moonlight King, and convincing him to grant the PCs what they want, or taking it from him. There are three problems with this section; basic description errors, a problem with the design of the encounters, and unexplained plot elements. -King is NG, and is a devil with the 'lawful' and 'evil' subtypes. This in and of itself isn't problematic. Issues arise when there are no explanations for why the king is a devil or any information about his history, and when the book specifically states that he is a 'glass demon'. Furthermore, the encounter description spends some time describing how he is attended by a 'hulking derro servant'. No such servant is statted up anywhere or involved in the encounter anywhere. -As best as I can understand, the encounter with the king has two phases. First, a social encounter, and if that fails or is dispensed with, a combat encounter. In the social encounter, the book seeks to have the PCs inflame the King's anger, and cause him to summon warriors and storm off to the courts, an arguably undesirable outcome and one which isn't included on the official outcome description list. The problem is that a later section says that the king storming off can be averted if the PCs convince him so during the social encounter; but again, the social encounter specifically seeks to inflame his anger. -The social encounter leads to the most confusing section of this book. As best as I can figure out, the PCs are meant to inflame the king's anger by lying to him, and blaming his woes on several key figures from earlier parts of the adventure. Through checks they tell the king that a demon lord drove him mad, that the queen sent him away, that the queen bound his mind with 'chains'. In support of these facts being lies is that they are mentioned NOWHERE else in the adventure. But, these facts are not reached through bluff checks, instead through K: Arcana and various other checks. Indeed, it is specifically stated that Bluff only works once, as the king is paranoid and wary. This contradiction is worsened by the fact that each individual one of these facts could be a side-quest in and of itself to discover in the previous parts of the adventure. That the PCs are just meant to pluck them from the air is utterly baffling. Overall, I had to work very hard to run this adventure. Scrolling between very different pages, working my way around sloppy 4e conversion work and re-thinking several key plot details. This adventure reaches high and falls very short of what it promises. But, if as a GM you are willing to devote a great deal of effort, you'll find a crude and somewhat creaky framework for building an adventure with fairly strong social elements, and interesting characters with interesting interactions. It all begins as the Moonlit King discovers that House Stross no longer holds sway in Zobeck (he's a bit behind the times, poor dear) and so all the arrangements and treaties that he had with House Stross are now null and void. Unsurprisingly, he's rather cross about it all! The adventure itself is constructed as five segments that would take a party from 7th to 11th level in the course of some 30 encounters (although they need not have them all to complete the adventure successfully). The key to it all is a neat mechanic for determining Status - because the Fey are nothing if not snobbish and elitist, and if you are of insufficient Status they do not care how reasoned your argument is, how strong your sword arm is or even how big your bribe might be! A party that successfully rises in Status will get their audience and be able to put their case to the Moonlit King. All starts abruptly as the party is called away from whatever they might be doing in Zobeck to aid a senior cleric who is being attacked - in his very temple, no less. A tough fight is followed by a quest to find out why the poor priest was being attacked and this will lead the characters into the adventure proper. A series of strange events beleaguer the people of Kobeck, and so it all begins. To succeed, the party needs to be smart and diplomatic as well as adept with spell and sword... and that's before they venture onto the Shadow Road and attempt to navigate their way through the Courts of the shadow fey! Then they will really need their wits about them! Strange things happen in the shadow realms. The encounters reflect this well, with some truly memorable and outright wierd events to throw at the party. This is where the Status mechanic comes into play: everything they do (or omit to do) affects the party's standing: to the level that some encounters only become available as they rise in Status to a sufficient level. The Court is massive and the party will be able to roam around, and perhaps interact with those denizens who deign to actually notice them. Eventually (we hope!) they will gain sufficient Status to be treated as guests rather than intruders, and the place comes alive about them. There is a great feast, the menu of which is part of the adventure in itself... and then it's time for the Duelling Season. The fey, it seems, love their duels. Mechanically, a Quick Duelling system is provided - and of course it also links back to Status. The climax of the adventure comes when the party gains an audience with the Moonlit King. And the outcome? There are several possibilities, including supplanting him and taking over the shadow realm! The most likely conclusion sees the party returning to Zobeck, with many tales that mere mortals may find hard to believe! Much is twisted, distorted, wierd... and as GM there is a lot to keep track of, so prepare well. Everything's well-presented (apart from a tendency for the text and the fancy borders to encroach on one another at times, so the odd word is hard to read), and most of the information is just where you need it. The PDF version is well-bookmarked, if running from a book you may want to put in some markers of your own. Bringing out the sheer otherness of the fey, this adventure is like none other and should provide a memorable element of your campaign. This mega-module is 130 pages long, 1 page front cover, 2 pages of editorial, 1 page ToC, 1 page SRD, 1 page advertisement, 1 page back cover, leaving us with a total of 123 pages of content, so let's take a look! GET THIS NOW. Seriously. Buy it. Give it as a gift to your DM. If you're a DM, get this NOW. If you, for whatever reason, want to buy only one Kobold Press-adventure - BUY THIS ONE. You're still here, aren't you? Ok, I guess I have to do better. First of all, let me address that this book features skill-challenges, i.e. obstacles your combined group can surpass by combinations of skill checks, with each player contributing (hopefully) something to the fray - they are designed in a way where even fighters will have something reasonable to do. Furthermore, above and beyond and a great help for DMs a bit weak on the fluffy roleplaying side, suggestions for the respective argumentations on why the skill in question works/doesn't work are given. Beyond these even, class abilities, spells and feats feature into the respective checks and get covered in a level of detail I've never ever seen in any publication - without bloating the book. And if you don't like skill-checks, you could still use these pieces of information as simple roleplaying guidelines. The same holds btw. true for incantations, which, while a part of the module, do not occupy a crucial role and can be abstracted rather easily. Ben McFarland has done an astounding job of translating the module into the context of Pathfinder-rules. It should also be noted that the module is relatively light on Midgard-specific fluff, i.e. it can be transported to Golarion or any other world you choose with minimum hassle - you just have to switch out cosmetic terms like "Zobeck" for another big city name and there you go. And that's about it regarding the formal qualities of the crunch - next up follows a VERY BRIEF synopsis of what you can expect - and thus from here on out reign the SPOILERS. Players, do yourself a favor and jump to the conclusion. You don't want this one spoiled, believe me. I'd actually love to play this, but having read it, that is out of the question. All right, we kick off when Zobeck (or another big city of your choosing) experiences a swift occupation: One day, everyone wakes up and finds that the shadow fey now run the town - and who violates their capricious decrees has to contend with their harsh, humiliating repressing punishments. Turns out after some research and diplomacy with the envoy of the scáthesidhe (shadow fey) and some reading between the lines, that an obscure deal between the former ruling family and the shadow fey has expired and that they now consider the city their domain - with an almost unstoppable Statthalter on the way. In order to reclaim mortal sovereignty over the city, the PCs have to research a ritual to send them off on the perilous journey towards the home of the shadow fey - and should they survive this journey into the very heart of shadow, they'll be surprised: The Scáthesidhe have made elitism a form of art and at first, the courts seem empty - those of too low status actually can't even perceive the upper ones of the layered, fey-glamour-clad echelons of the courts and in order to gain an audience with the queen of the fey, they'll have to first rise in status. From lowly goblin servants, lantern dragonettes and fey rakes to the higher echelons of court, the PCs will require all their wits and capabilities to survive the perils of the dueling season and slowly work their way up through a court enamored with the theft of memories, illusions and deception. Courtly intrigue and harmless and not so harmless pranks abound even before the PCs become aware of the existence of the Demon Lord of Roaches as a fixture in the court, of the various deadly factions (which include a celestial and old weaving crones that are more than they seem) or of the alluring courtesans and courtiers that can play a pivotal role in the rising through the ranks of the courts - if the PCs can manage to win (and keep) their favor. And yes, the affections of the shadow fey may very well turn out to be something rather problem-laden, as some of the numerous NPCs, both mortal and immortal that frequent the courts can attest to. Even before the Black Prince's favorite quickling swordmaster challenges the PCs, even before the factions start actively recruiting PCs, we actually get a codified, complex and thoroughly rewarding rules-framework for the depiction of rising through the ranks of a court, a system, which when reskinned towards mortal courts, could be used for Song of Ice and Fire-like machinations. And I have only scarcely touched upon what there is to come - what about e.g. a hunting trip with the hostile and antagonistic Black Prince and a chase for the immortal firebird, represented via a cool, mapped mini-game? The very best banquet-scene I've ever seen in an adventure - easy to run, complex and thoroughly weird? A roach-like, loyal warrior who just wants to find a nice place to lay eggs - which have to unfortunately hatch from a body? The lists upon lists of events, intrigues etc.? The glorious maps? What about the fact that the finale, when the PCs may finally get their audience with the Queen, requires them to find the insane Moonlight King in a maze of light and unique dangers and either kill him (in a fight that challenges brains and brawns) or convince him to abstain from the claim to Zobeck? Have I mentioned the potential to transcend the bounds of mortality in the aftermath of this module? Editing and formatting are the one weakness of this module - while not bad by any measure, I did notice a couple of editing glitches that could have been caught and here and there a small conversion relic in places where their presence is not crucial in any way. Layout adheres to a beautiful 2-column b/w-standard and the provided handouts and maps should water the mouths of any aficionado. The artworks are original b/w-pieces that fit thematically well within the context of the book, creating a seamless, unified impression. The pdf is extensively bookmarked for your convenience, though I'd still recommend getting dead-tree for this one. Wolfgang Baur and Ben McFarland are immensely talented designers and authors - that's no secret. But even as a fan of many of Wolfgang's pieces, I can't recall any one that blew me away like this one did. Not one. This is the 123 page refutation of the claim that social interaction in Pathfinder is boring, the triumphant sneer in the face of all who claimed that d20-based systems with their combat-focus don't lend themselves to social interaction, court intrigue or any scenario, really, that requires subtlety. "Courts of the Shadow Fey" is a legend, one I slowly digested over multiple months, because every single page herein had some idea, some spark that made me cackle with glee, a pervading sense of jamais-vu pervading the pages - more of it than in the whole catalogues of some companies. I have no doubt that this module will become one of the must-have-played pieces of Pathfinder with its complex sandboxy structure, its attention to details. Its inventiveness and its elegant, at times beautiful, at times creepy blending of themes serve to more perfectly evoke what being "fey" is all about, it redefines evil in the context of fey as a form of elitism that may very well be justified. Even if I tried, I could have never conveyed the sheer scope and awesomeness of this module, cover all the ideas herein, short of copying about 90% of the module. This is the gold-standard of what an ambitious module should be like and while perhaps not recommended for novice DMs, this is incredibly good - almost painfully so. And much like its unconventional ending that resounds so well with the theme of returning from the lands of the fey, turning the last page of this book left me with a sense of loss that it had ended, that there were not another 100 pages of shadow fey waiting for me. If I could, I'd rate this 6 stars. I got this book this year, so it will feature on my top 10 of 2013-list. It's one of my favorite Open Design/Kobold Press-books released. It's one of the best adventure-resources out there, either as module or setting and in scope, quality and detail on par with Coliseum Morpheuon. I'll repeat it again: GET THIS. Even if you run Golarion, not Midgard. Want a break from Kingmaker? Get this. Run another setting? Get this. Don't have a group and want a good read that is inspiring? Get this. Need ideas for fey tricks, hazards etc.? Get this. This is my unanimous recommendation towards anyone who even remotely is interested in the topic of fey: WHAT ARE YOU WAITING FOR? GET THIS! Final verdict? 5 stars +seal of approval - this might be the best things Wolfgang Baur has written so far - I know I consider it the best one, and Ben McFarland has gone above and beyond to make this work in PFRPG. When do we get the courtly intrigue handbook for mortal courts? PDF and Print/PDF bundle to be announced soon, I hope. The print/PDF bundle is live now, in fact! Not sure why the PDF-only is missing. Liz the Gninja will know. I have a question about this part. If you add fey monsters in this book, does that mean Paizo/Pathfinder doesn't use that monsters anymore because you already used them? For example, in this book is the Buggane and Erlkonig (two random fey creature examples), does that mean that Pathfinder Bestiaries or AP's will never use these monsters again because they think they are already handled in this product? If a monster is open content (I'm not sure if that's the case here as I don't own the book yet), Paizo will make use of it if it makes sense for them to do so in an adventure path. They've done so with other open source critters found in such tomes as the Advanced Bestiary by Green Ronin and the Tome of Horrors by Necromancer Games/Frog God Games. Also, since the two critters you mentioned have been drawn from Real Life mythology, there's no reason to think Paizo won't create their own versions of the mythological creatures for their own games if they haven't already, assuming of course that there's an interest among the Paizonians in creating the monster for the Pathfinder RPG or the Pathfinder campaign setting. What I really meant with this question is: Does Kobold Press & Paizo work together on monsters, and do they share monsters between them or do they both create their own versions of one species. Pathfinder created a Minotaur, so Kobold Press doesn't create a own minotaur because Pathfinder already has one, and Kobold Press creates a Buggane (random name) so pathfinder doesn't create a buggane anymore because Kobold Press already handled that creature well. or are they both very different compagnies that don't work together and will both work on their own versions of the monsters. Ah, that's a fun question! Most of the time, smaller publishers like Kobold Press use the monsters that Paizo provides in the Bestiary 1, 2, 3, etc. So there's no reason to create a new version if Paizo has already done one. Sometimes, though, Paizo does pick up versions of monsters from other sources (including at least twice from Kobold Press!). So, I would say that most of the time, people avoiding creating duplications of the same monsters, especially from a known source. Sometimes, though, we do wind up with two versions, and that's not bad: usually they are for different CRs, so they are useful to different levels of play. Goodness...I'm not sure, 45ish different sorts? maybe a few more? I'm not counting the ones that are duplicated across a few encounters or only slightly differentiated. It's a *big* sandbox social, political, roleplaying extravaganza with a hearty helping of good, old-fashioned facesmash dueling and bloody court intrigue. I have been waiting for this one for a while. It will soon be added to my collection. How does it differ from the 4E version? I didn't even know there was going to be a PFRPG version, tho it makes sense with 4E's imminent/current demise! It is 30 pages longer, it has a few pieces of new art, the skill challenges and spells are all fully converted, the levels are now 7 to 10, and the book got a completely updated layout and some additional errata to clarify the family tree for royalty and some bits of intrigue. Haha you just want me to get two copies of the same book! I know I can't be the only person who sees Fey and is thinking about their Kingmaker game..
Also, is this best played as one big chunk of content? Or is it safe to spread it thin and let players interact with the Shadow Court as they see fit, during their normal campaign? The Courts themselves are fairly independent of any campaign setting and could work quite well indeed for a Kingmaker campaign. One big chunk of content would be the most useful, as getting to and from the Courts isn't easy. Really, it's the opening act which is location specific, but you could easily substitute that with another method for providing the route to the courts. As for the time in the courts? No, that's best done as a single chunk of content. And Courts shows up as #6 in the Top Downloads this week! W00t! I'll be interested to see whether it merits a review in its new form. It's certainly a nice addendum to Kingslayer, as Lilith and Dunebugg kindly point out. I think it should, there is a lot of new content and really creative gameplay in this book. I just acquired "Courts of the Shadow Fey", and I skimmed through it. I love it already, and it looks like a masterpiece. I like the whimsical yet deadly ambiance of the Courts, and the status system looks great: it reflects well the almost totally arbitrary system of values of the Fey. I have players who would most appreciate the adventure, I think, if I succeeded in not aggravating them too much while running it :-). The Fey have the potential to be supremely irritating to stereotypically straight-thinking heroes (not that my players play these, mind you). Thank you, Quiche Lisp! The adventure is one I think ties in very neatly with the new Fey Revised book by Paizo. And the adventurers do indeed need a bit of ability to outthink their foes, rather than just outfighting them. But hey, that's the fey all over. I am actually planning on using this in my Kingmaker Campaign to hopefully great effect. I am going to implement a connection between Vordakai and the Shadow Fey. My thoughts are that Vordakai actually has a significant pact with the King and Queen of the Shadow Fey and they have pledged to not get involved in the land as long as Vordakai is still alive (undead or otherwise). Basically, as soon as the party defeats Vordakai, the pact ends and we can go right into Courts of the Shadow Fey. I think the party will be very surprised when their home-town suddenly becomes challenged in regards to the legitimacy of rule. They will not take it well. They should be level 10 and I really appreciate Mr. Baur's progression of levels to make the CRs challenging. We'll have to see how it fits into the rest of the adventure path, especially Nyrissa, but it is the way I'm going to go. ´What LVL is the adventure for? It has encounters for levels 7 to 10, as per the title page. Or were you asking The Baim about his use of the encounters? no reviews yet? :) Come on now, let us know. Huh. I don't think I ever got my PDF from my preorder. Have to check my RPGnow account. I'd write one. I like it a lot. But I am not quite as experienced with reviewing campaigns and adventures. I'd give it a 4 out of 5 though. It loses 1 due to the half-elf/elfmarked mix-up (half-elves were left as half-elves). Though I was told you can just move them to elfmarked, Full Elves or eliminate them altogether. Finally reviewed first as part of Fey-Day on Endzeitgeist.com, then submitted to GMS magazine, Nerdtrek, posted about it on Lou Agresta's RPGaggression and posted it here and on OBS. Cheers! Just messing with ya. Nice review, as always. This one is on my to-buy list. I do plan to run it in my Zobeck campaign. This one gained a lot from the "conversion", as Ben and I took the opportunity to improve and expand the adventure for Pathfinder. There's new art here and some tweaks to layout as well, and a meaty new appendix. Purchased after reading Endzeitgeist's review (and it arrived already today from Amazon, love two day shipping...). This Sunday, I'm running Sorrow from Tales of Midgard as a side adventure in my Kingmaker campaign. After two years in the current campaign, my players are looking forward to trying out different characters for a night. However, this looks like a good continuation and something I can run on/off again and easily insert into my ongoing campaign. John-- Sorrow is an excellent prelude to Courts of the Shadowfey, and the Status benefits in Sorrow were specifically modified in consideration of Courts. Thanks, I'll definitely have to keep the status's in mind, then! And Ben, it was nice finally meeting you in person at Gen Con after the Kobold freelancing seminar. I am very, very pleased to announce that this adventure was named to the Top 10 Pathfinder Releases of 2013 by no less than famed reviewer Endzeitgeist! The listing appears in the current issue of Pathways. Is there a Hero Lab file with the NPCs in it out there somewhere? I don't believe there is. I've added this (with significantly pumped-up faeries) to my Kingmaker campaign, subbing it in for some of Book 4. At our last session, one line from the book created one of the funniest moments of our campaign. My players visited Ambasssador Thelemadrine. His footman announced them, and I noticed that the text said he wouldn't announce barbarians. So the footman announced each of the players, with long, elaborate titles based on their deeds throughout the campaign. Each player clearly enjoyed me rattling off these excessive titles in my British servant voice. And then ... I didn't announce the barbarian. Everyone looked back and forth between the barbarian's player and me. And then the player said, "I'm not coming in until I'm announced!!!!" It became something of a recurring joke that the shadow fey considered him beneath them. While the duchess negotiated with Thelemadrine, a servant was educating the barbarian on the proper use of tableware. The "education' included rewarding him with meat when he answered a question correctly. I'm launching Courts of the Shadow Fey into my campaign this month. Looking forward to playing around with the fey worlds in this one. Pennywit, that's just dead-on perfect. And hey, "Barbarian treats" seems like a great motivational tool. Looking to finish a massive run through Courts of the Shadow Fey during our next session! We added side missions from Tales of the Old Margreve and Midgard Tales to flesh out the adventure. What a long strange trip it's been! Meeting the Queen of Night and Magic. I finally finished this last night. What a great adventure in a fantastic setting. It's just a shame that the Pathfinder version is so sloppy. It takes a lot of work on the part of the GM to make it work. I am happy to say we finished it in almost perfect fashion. The heroes returned to speak with the Queen and she gave them her closing speech, finishing with, "And you will always be welcomed here in the Courts of the Shadow Fey."